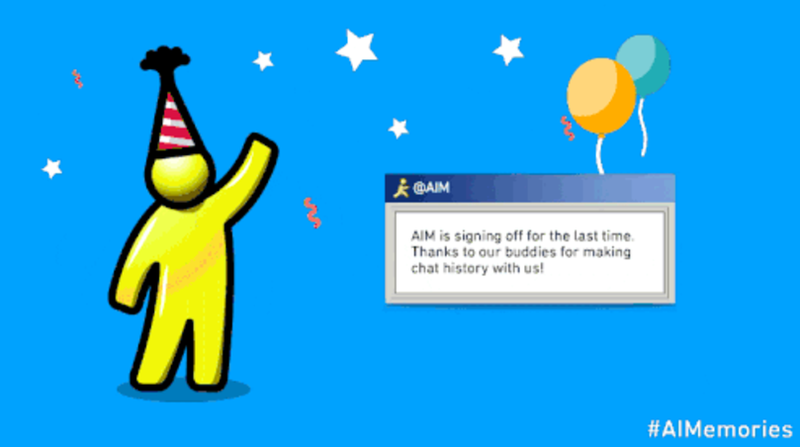 AIM, a pioneer in the world of online messaging, is shutting down after 20 years. The service will officially shutter on December 15, with no plans for an official replacement from Oath, the Verizon-owned company that includes both America Online and Yahoo. AIM was an instant hit when it launched in 1997, even if AOL never fully embraced the idea of free online messaging. For millions of people, it was a first taste of instant text-based communication. I can still remember using AIM in primary school and high school — it was how I learned to type. AIM also introduced the internet to the concept of the status update with its Away Messages. A simple line of text to explain you absence or make a joke helped inspire modern online giants such as Facebook, Twitter and even WhatsApp. In a blog post announcing the news, Michael Albers, VP of Communications Product at Oath, described the important of AIM while admitting that the messaging service hasn't been relevant for many years. "AIM tapped into new digital technologies and ignited a cultural shift," he wrote, "but the way in which we communicate with each other has profoundly changed." Oath says it won't offer a replacement for AIM once it shuts down later this year — there are more than enough options out there already. The company also detailed how you can access and save your old chat logs and shared images in an FAQ page, in case there's anything you want to salvage before the messaging service shuts down in a little over two months from now.